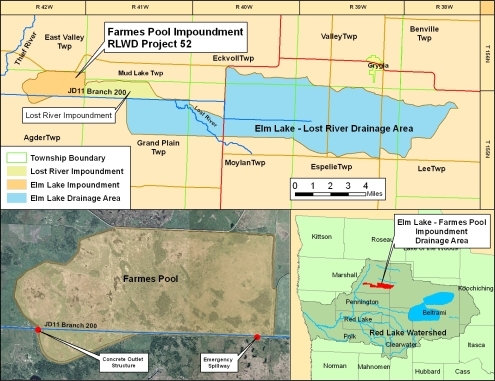 The Elm Lake-Farmes Pool Project (RLWD Project 52) is located in Marshall County, about 17 miles northeast of Thief River Falls. The drainage area of Ditch 200, upstream from Elm Lake, is 63 square miles. Project 52 is designed to accomplish three main objectives: to provide a means of flood control in downstream areas, to improve the value of the area as a wildlife habitat, and to improve the drainage in upstream areas. Elm Lake was drained in about 1920 by the construction of Branch 200 of Judicial Ditch 11. 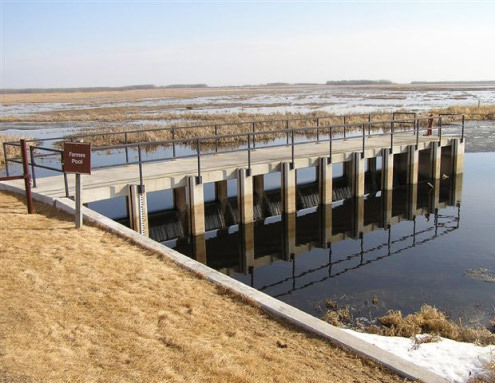 The Elm Lake Project, made operational in 1991, was built partly as an effort to restore wildlife habitat. It was a cooperative effort between the U.S. Fish and Wildlife Service, the Minnesota Department of Natural Resources, the Red Lake Watershed District, and Ducks Unlimited, with majority of the funding for Project 52 provided by Ducks Unlimited. At the time of construction, Project 52 was the largest Ducks Unlimited project in the lower 48 states. Project 52 consists of approximately nine miles of earthen embankment, an outlet control structure at the southwest end, a rock-lined emergency spillway at the southeast end, and an enlargement of a portion of Branch 200 that feeds into the Lost River impoundment, upstream of the Project 52 structure. After the 2007 Spring runoff, the stop-logs were removed from the Farmes Pool outlet structure, the screwgate was opened, and the pool was allowed to drain to a drawdown state. The Agassiz National Wildlife Refuge staff performs the actual operation of the outlet structure in cooperation with the Red Lake Watershed District. During the drawdown period, staff from the RLWD, Agassiz NWR, and the Minnesota DNR worked with a Professional Engineer from the Minnesota DNR to perform an inspection of the outlet structure. The inspecting group determined that the metal stop-logs and channel iron stop-log slides were deteriorating. Repairs were scheduled for 2008, a prescribed burn was conducted with the pool in drawdown, and the pool level was restored to its typical winter elevation by closing the outlet and drawing water from the upstream Lost river Impoundment.